E-Products allow you to sell products such as MP3's, e-Books, PDF, and just about any type of downloadable digital products. Unlike conventional products, links to the e-products are generally emailed to the client upon purchase and can be downloaded by them. The 3dcart shopping cart system can automate the whole process for you and give access to the e-products purchased immediately after the client has paid for them. Additionally, 3dcart can accommodate sending serial numbers to your customers along with the eproduct file. Click "Save" at the top right to complete the process. The File Manager (in your 3dcart Online Store Manger interface) can only accept image files. If your eproduct is an image, then click on the File Manager button in the store manager and click the Upload Files link to choose your image file. If your eproduct is anything other than an image or PDF file (such as .mp3, .doc, ppt, or E-book), you will need to move this file over via FTP. 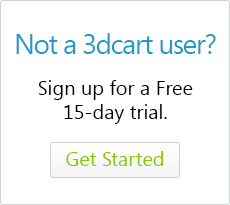 To FTP to your site, review the Welcome Email you received when you started your account with 3dCart. Use the FTP username, password, and hostname to connect. Once you are in the FTP, move your files to the web/assets/images folder. Now, let's create a product in the store, using the Online Store Manager. If you already created a product, skip to step 4. Click on the +Add New button to add anew product. Enter the Product Name, Description, and Price and save the page. Be sure to hit save before navigating away from the Information tab to make sure you don't lose your product info. Click on the Browse button to search for the file you uploaded to the File Manager (either via FTP or through the Store Admin). Click the Select button next to your eproduct file. With 3dcart, you can specify up to 10 individual e-product file paths. This can be useful if your eproduct is large and you'd like to offer it as smaller file sizes to faciliate downloading. Alternately, you can also use this function to have multiple e-product files available for download. For example, different types of the same image file like bmp, jpg, gif, etc. Skip these steps if your eproduct does not need to issue serial numbers. After the purchase, the customer will receive a receipt with a link to download their file in the New Order Notification Email. 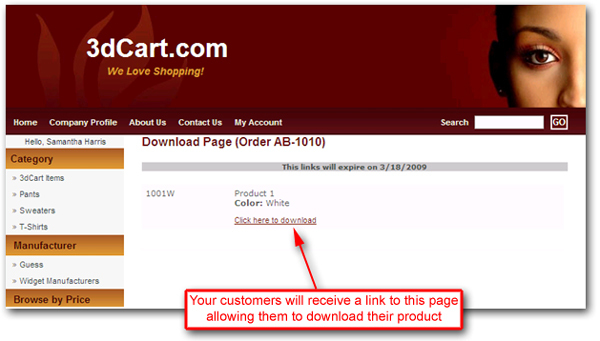 The page contains the product name, a link to download it, and the expiration date. Additionally, the serial number will display on this page, if one is issued. Furthermore, while the e-product download is still active and not expired, your shoppers will be able to access the download link at any time via their respective "My Account" pages.